BROWNSBURG, Ind. (Oct. 28, 2014) – Ron Capps and the NAPA AUTO PARTS team are intent on climbing up the NHRA Mello Yello Drag Racing Series championship standings this weekend in the NHRA Toyota Nationals at The Strip at Las Vegas Motor Speedway. 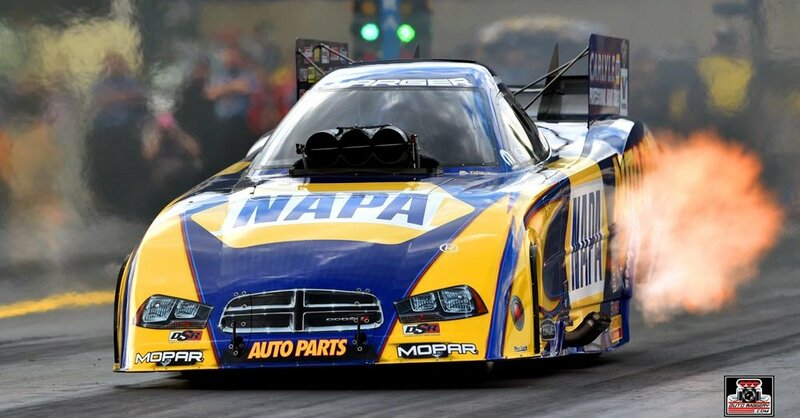 He won’t rule out overcoming Don Schumacher Racing teammate Matt Hagan, who sits atop the standings with two events left in the season, and is confident the NAPA AUTO PARTS Dodge Charger R/T team can at least move up from seventh in points. A perfect weekend for a Mello Yello driver can produce 150 points and that means 300 can be earned over the last two events. Ron is 169 points behind Hagan and 97 out of third. “It’s a longshot but mathematically we can still catch Hagan,” Ron said. “It’s important to us that we finish the season strong. The Strip at Las Vegas Motor Speedway has been good to Ron. He has won a track-best five NHRA Funny Car titles there including four times in the fall event. He has swept the track’s two annual events in 2001, 2011 and 2012. Ron and the NAPA team have won two titles this season through 22 events and are one of only six teams to win at least two NHRA Wally trophies. “We’ve gone through the year with a consistently great race car, but with the Countdown to the Championship set up the way it is you don’t have to be the best car all year long like it used to be; you have to have the best car over the last six races. Don Schumacher Racing’s drivers will hold a special autograph session on Thursday on the bridge in front of the New York-New York Hotel and Casino from 6-8 p.m. to kick off the NHRA Toyota Nationals. The free gathering provides fans with autograph cards for each driver including Antron Brown, Spencer Massey and Tony Schumacher in Top Fuel, and Ron, Jack Beckman, Matt Hagan and Tommy Johnson Jr. in Funny Car.